Greeting everyone. Here is a short blog about what my experience on the first match for the World Cup 2014. The first game of the FIFA is started on June 13 on sharp 3.00 a.m. Usually during this time, I'm sleeping like a pig. But on that day is different, it is the first match of the FIFA World Cup. Guess what the host of this year is Brazil and they are the first game of the FIFA match (Brazil vs Croatia). Basically, watching at home or streaming doesn't have the ''feeling''. So I decided to go to my nearest BRJ Shop ( is a mamak store) around 1am *if i'm not mistaken*. What I did not expected is it quite a number of people also waiting for the first game to kick off. Moreover, there are event from Mission Foods at the store there. They are promoting their potato chips and also giving prizes away on that day. Every table will have potato chips from Mission Foods and we also get a "plastic hand clap" and also wisel . Besides that, we needed to predict how many score will Brazil and Croatia get. Of course I predict Brazil-3 and Croatia-1. During the first half, I quite shock is Brazil own goal. I thought Brazil will the first goal for the match actually. This make Croatia's 1 goal advantages during the game. Before it gonna halftime, Brazil getting back 1 goal also and this make it tie. For the first game Brazil-1 and Croatia-1. On the second half, Brazil score a goal on the 71 minute. Everyone is shouting, clapping hand, jumping, shouting, and a lot more features when the Brazilian player (Neymar) score a goal. Even I also shouting when there are a goal. Actually, I quite nervous that, when the time is on 90 minutes (Brazil-2 and Croatia-1) because I mention I predict Brazil need to score another goal to become 3 and this become reality. On 91 minutes, Brazil did score another GOAL. On that time, I really happy and excited. After the match end, the Mission Foods authority called my name because I'm get the 100% prediction. Yayyyyyyyyyyyyy! This is my experience on the 2014 FIFA World Cup. How about readers :) ? 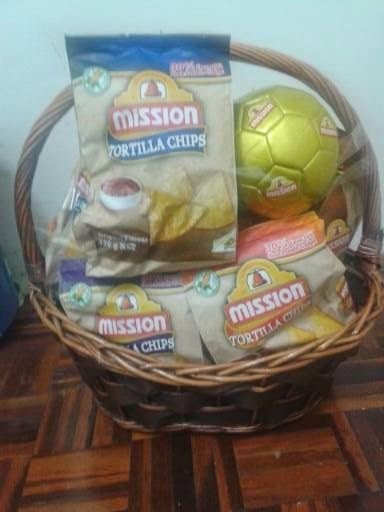 This is the prizes that I won for the prediction score for the first match of FIFA 2014. Don't forget to follow my network too. Do mention for a follow back :).